Yes, I’m a little too short for a stormtrooper. 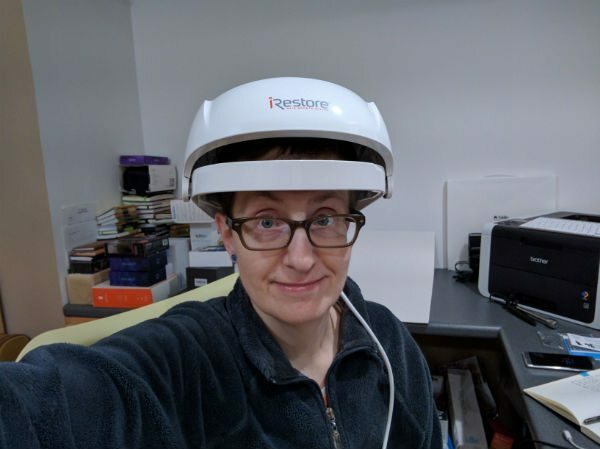 But my head is just the right size for the iRestore Laser Hair Growth System hat / helmet / cap / thingy. Actually, they call it a dome. What is it and why am I wearing it? Keep reading to find out. 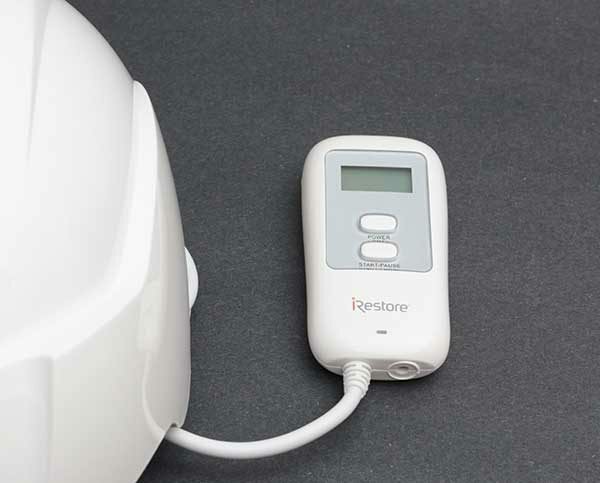 The iRestore Laser Hair Growth System is an FDA-cleared laser hair therapy system for men and women who suffer from androgenic alopecia. 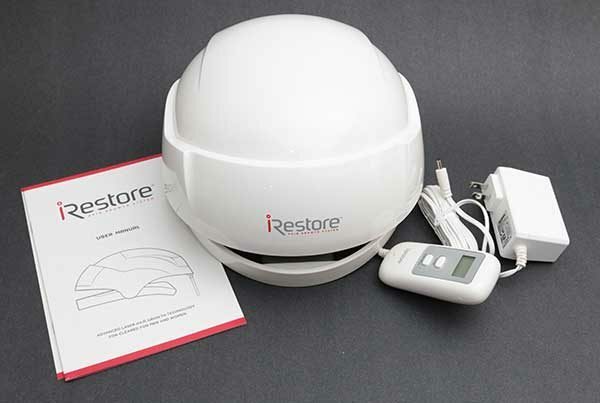 The iRestore dome is made of white plastic. 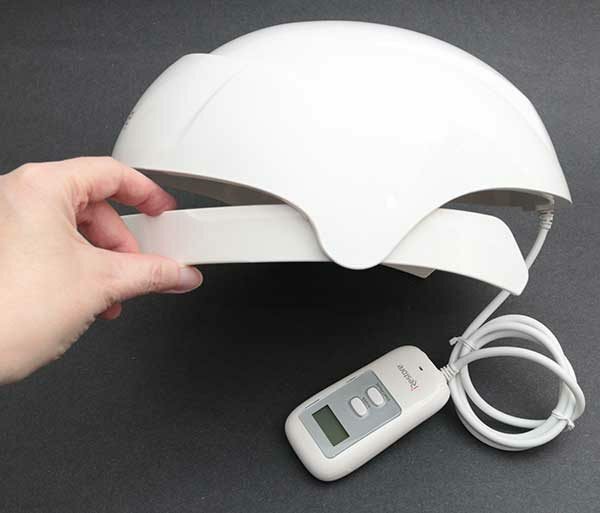 It has a built in head band that helps keep the dome in place during therapy sessions, and it has a handheld controller that is used to start and stop the sessions. Inside the dome are 21 lasers and 30 LEDs that emit a specific wave length of light. Also inside the dome are several soft cushions that allow the dome to fit comfortably on your head. The controller has a small backlit display that shows a timer while the session is in progress and there are two buttons that control power, and start and stop the session. Why would you want to use this goofy looking helmet? Having very thin hair or balding areas on your head can be traumatic for some people because humans tend to judge others on their appearance. 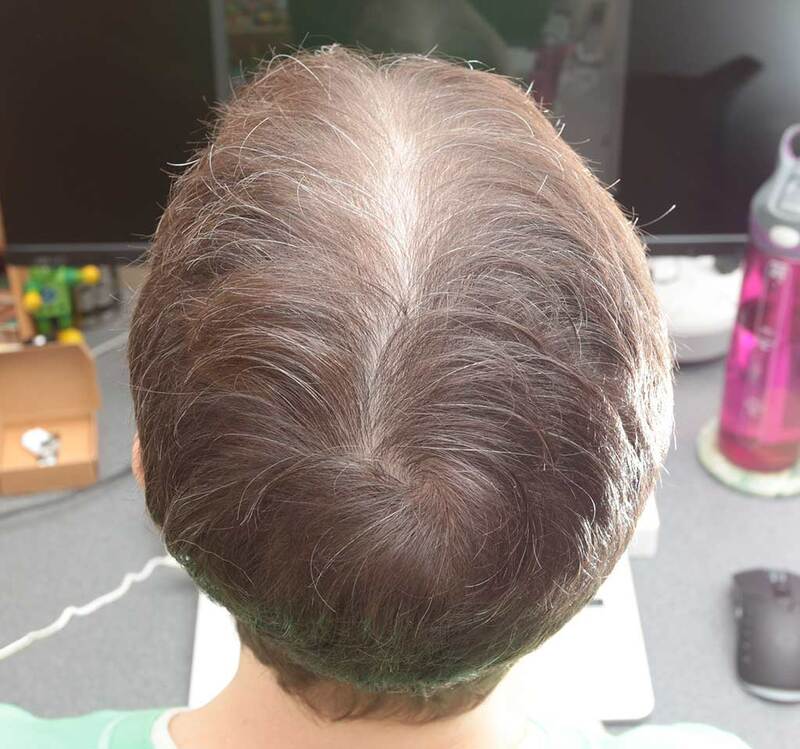 The iRestore system claims to be able to promote hair growth in men ages 18-48 and women ages 18-60 who have androgenic alopecia. 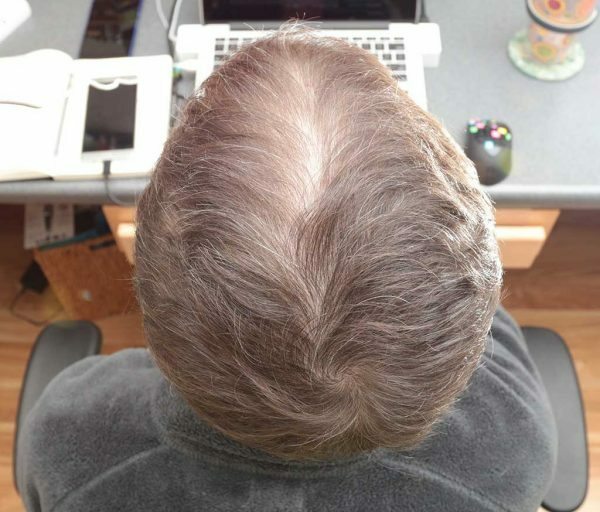 For men, this is usually referred to as male pattern baldness which is classified on the Norwood-Hamilton scale. The iRestore system claims to help men who fall in the Class IIa to V range and in the Fitzpatrick Skin Types I to VI range. 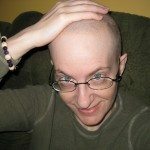 I didn’t get that upset about my hair falling out due to the chemo. 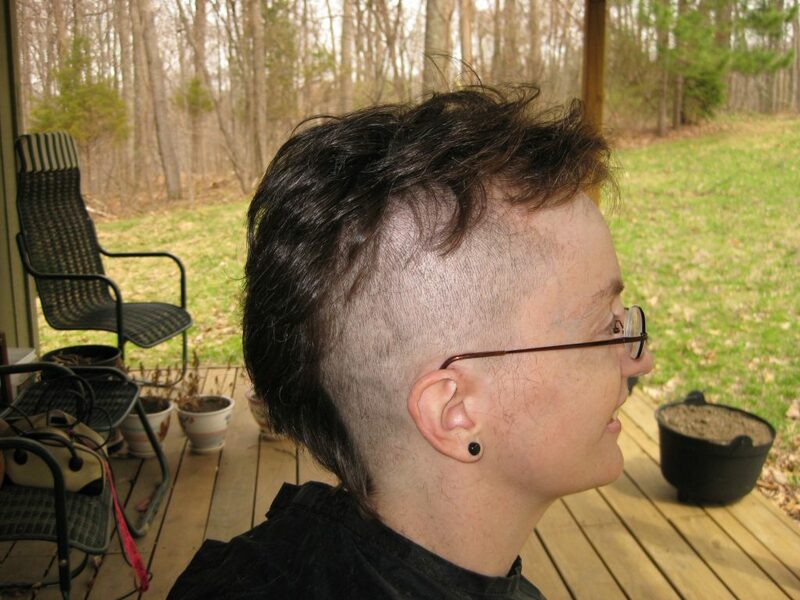 The first day it started happening, I called the person who cut my hair and she came to the house and shaved it all off. It was really pretty liberating. But unfortunately, it didn’t grow back as thick and full as it had been before all the chemo and another drug I was on for about 4 years. Using iRestore is very simple. You just put it on your head like you see above. The helmet isn’t very heavy or uncomfortable. The cord coming out the back gets in the way a little bit, but it’s not a huge deal because the sessions only take 25 minutes every other day. You just press the power button on the controller and then the start button. The LEDs turn on and off for twenty-five minutes and you’re done. The controller beeps at the end of the session and the LEDs automatically turn off. About 15 minutes into the first session I thought I felt my head getting hot, but it was probably my imagination because I’ve never felt that sensation again. Your head doesn’t get hot at all… at least mine doesn’t. So is it working? It’s too early to tell because it takes 16 weeks before you know. Yes, that’s a long time, so I plan to do an update every 4 weeks. 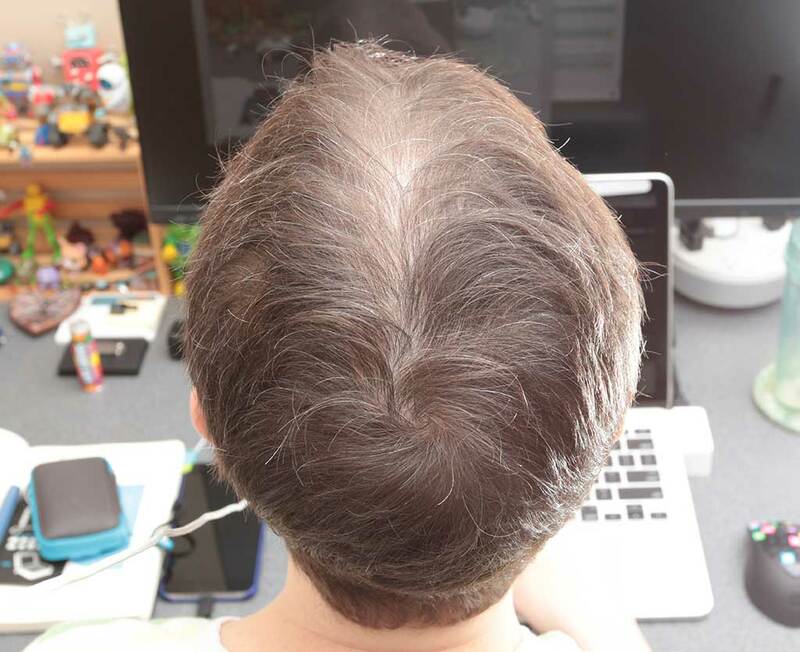 This the top of my head where the thinning is the most noticeable. This picture was taken on 8/29/16 before my first iRestore session. 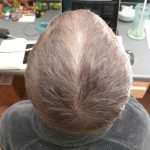 So far I’ve done 9 treatments and am not noticing any new hair, but I plan to keep doing the treatments every other day for the full 16 weeks and will continue adding photos and updates every few weeks. I’m pretty skeptical that it will help me, but I’m happy to take one for the gadget team and give it a try! So stay tuned and keep checking back for updates. 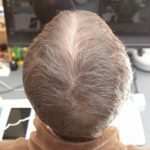 I’m a quarter of the way through the 16-week treatment window and have posted two more pictures of my hair from the last two weeks. 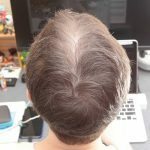 After 15 treatments I’ve not noticed any new hair growth. However, I have noticed that I’m shedding less. How am I measuring that? Not by any scientific means. Basically, I am just looking at my pillowcase before going to bed to see if there are hairs on it from the previous night. In the past, I’ve always seen 4-5 or more hairs, but lately, I’ve only found 1 or 2 hairs. Is this evidence that the iRestore is actually working? I’m still pretty skeptical, but I’ll continue to monitor things with another update in 2 weeks. It’s been two weeks and several more sessions since my last update. I’m still not seeing any obvious new hair growth. But like I said in my last update, I’m pretty sure that I’m shedding less than I was before. I did receive an email from the PR folks for iRestore saying that they could send me their special shampoo and hair serum to try too. I declined that offer because I want to review the iRestore by itself. They also said that it might take as long as 24 weeks to notice positive changes. That differs from the information that came with the iRestore which says it takes 16 weeks. Right now I’m about halfway through the 16 week period. I’ll have another update in a couple weeks. 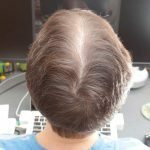 It’s been almost a month since my last update and as you can tell from the last two images above, no new hair… I’ve had an email from someone saying my pictures can be subjective and might not give the true picture. 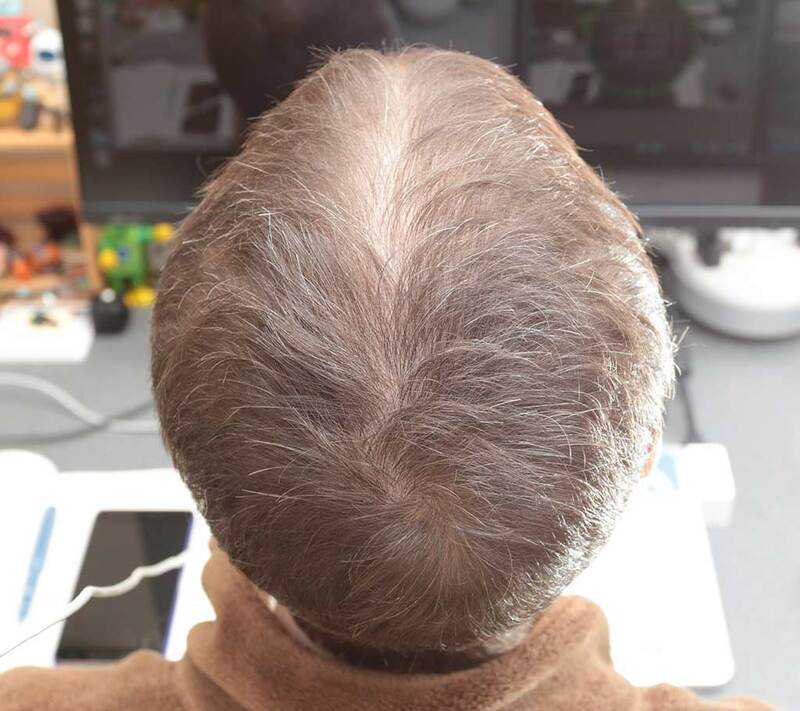 He suggested that I do a video around my head to show things better. I actually tried to do that but it’s almost impossible to do it by myself so I’m sticking with the pictures. I’m disappointed that after almost 3 months that I’m not seeing any positive changes. 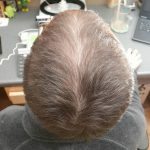 I still have 5 weeks left in the 16 week test, but I don’t hold out much hope that I’ll see any new hair growth. Hope I’m wrong, but I don’t think I will be at this point. I’ll be back in a couple of weeks with another update. 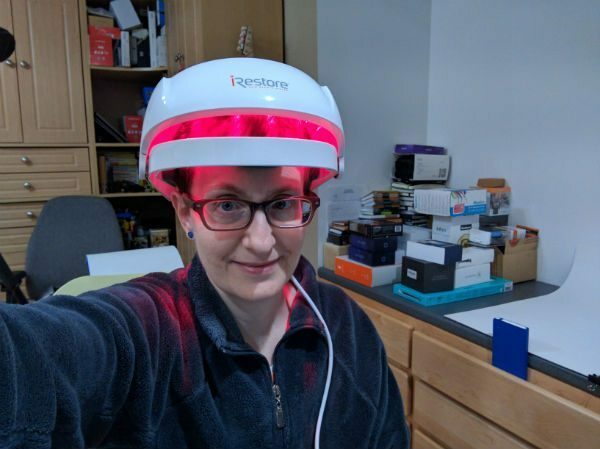 It’s been 16 weeks since I started testing the iRestore Laser Hair Growth System. Every other day I’ve worn the helmet for a 25-minute session. 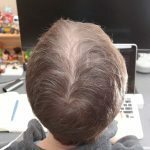 I did miss a couple days when I was on vacation this summer, but other than that, I’ve been diligent in keeping up with the routine so I could do a real review to see if their claim of thicker and more hair in 16 weeks of using this product was true. 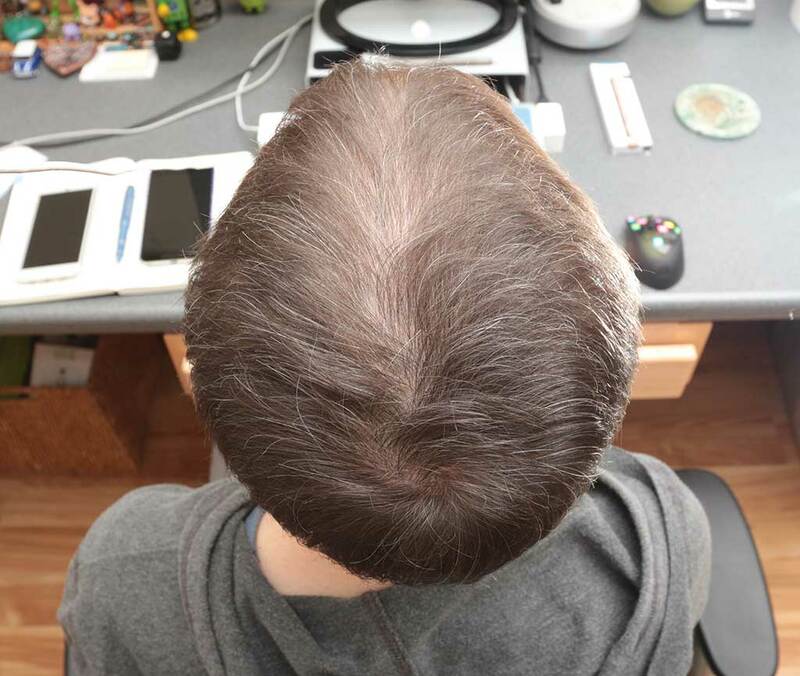 As you can tell from the collection of images above, I don’t think the iRestore made my hair grow any faster or thicker and it did not as far as I can tell, cause new hair to grow in the thin spots on the top of my head. Having said that, I can’t be 100% certain that anything can help my hair become thicker. I think my issues stem from the different chemo drugs that I was on. My hair has never been as thick as it was before it fell out 5 years ago. So there is help that the iRestore can help people, I just don’t see that it helped me – at all. Source: The sample for this review was provided by iRestore. Please visit their site for more info and Amazon to order one. I completely understand. It does feel different when you’re female though. I think hair is more important to women and more important to the way people feel about a woman. 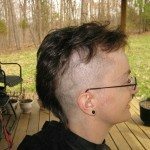 It’s completely acceptable for a guy to be balding, or have a buzz cut, but not so much for a woman. 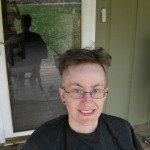 Case in point, I was recently shopping at Walmart and some older guy in a wheelchair made the unsolicited comment that it looked like someone had done a number on my hair. I asked him what he was talking about and he repeated his comment. I replied that I like to keep my hair very short. Then I turned away and he said “looks like a boy’s haircut to me” I just walked away without saying anything because it took me off guard and kind of embarrassed me. Of course 5 seconds later I was just pissed about it, but it was too late to make a witty comeback. Don’t worry about it. There are a lot of strange people at WalMart. I’ll include Walmart to my list. Wow the nerve of some people. I swear people just spout things off without thinking about what they are saying first. I wear my hear very short also. It is a personal choice (mainly because I am lazy and just do not want to spend more than 5 min on it a day. Plus long hair gets in the way of a lot of the physical activities I like to do in my off time) and my choice alone. I think your hair looks great and I would never have noticed it was thinning you if you had not mentioned it. Too bad it only works for men up to age 48. I know my husband would have been interested. Don’t let Max use it as a kitty bed. The results might be hairy. Hahahaha! He already has more than enough hair! I’m using it as well. 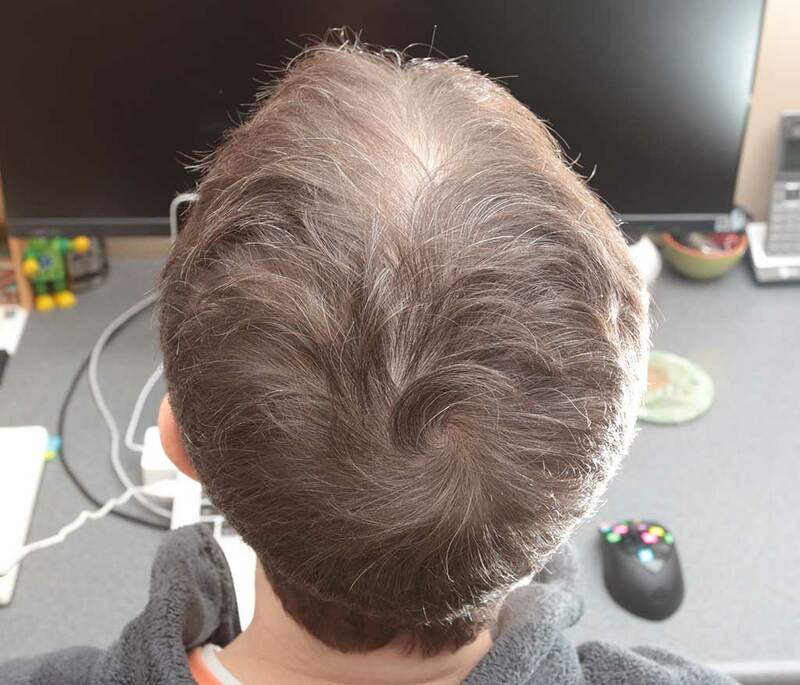 It’s hard to tell if I am going bald more slowly or not. What hair I have grows faster I think. 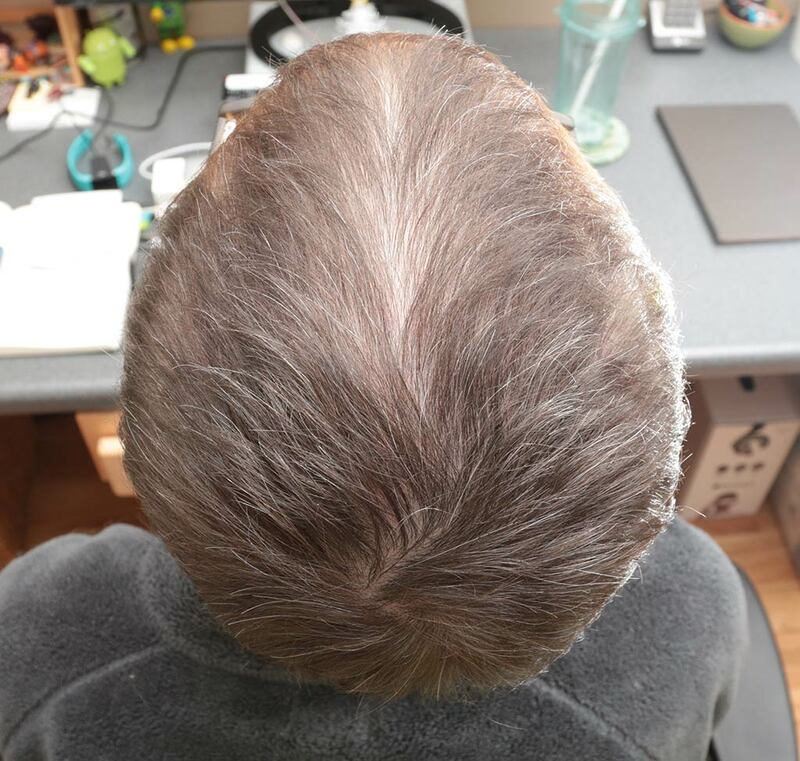 A lifetime tendency to dandruff has gone away so that at least is good! Watching your laser treatment with interest. I’ve not heard of Nioxin. I’m I correct that it soaks into the hair strands and plumps them up? I’m not sure if I would want to do that since I’m assuming that you’ll have to continue buying and using the product forever. Right? Interesting though! From their website it appears to be standard hair care shotgun nonsense. And I find it despicable when product developers name their product with a “hint” of the name of something that actually works. Obviously Nioxin is supposed to invoke the actual medication Monoxidil when in fact it has no proven medication whatsoever. Hi Julie, Yes it is possible it is just plumping up the individual hairs or even coating them and you use it forever. Well it’s the most effective dandruff treatment I’ve had ! Thanks for taking the time to put up all the photos of your hair from the laser treatment. That tells a story. 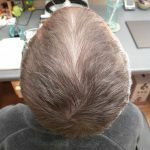 Obviously hair loss is a serious issue to men and especially women and it’s a ripe for unproven treatments. You guys shouldn’t be adding to this problem. Alan, that’s why I’m doing a real review that’s going to take 16 weeks to finish. 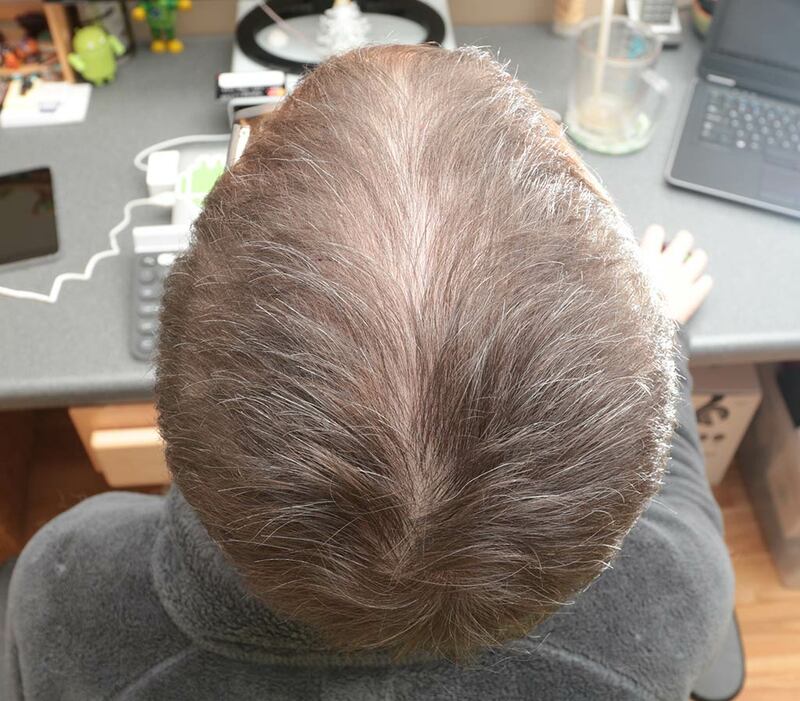 Hello, I am looking forward to your review as I am a 43 year old male who finally bit the bullet and had a procedure done at Bosley yesterday. 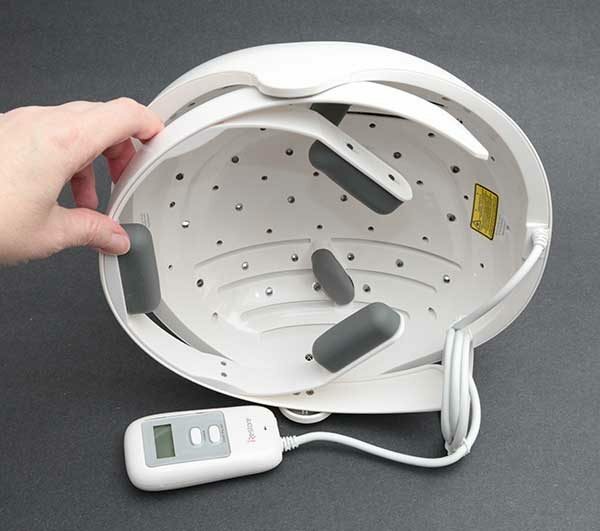 The doc recommended some sort of laser therapy to keep the hair I have and I ran across this product on Amazon. I am looking forward to some real world testing before I spend that kind of money on a product. Good luck to you as I hope it gives you the results we all hope for! I forgot to mention I had cancer at the age of 12 and wonder if there is a correlation with my hair loss from chemo to the hair loss I have now?? 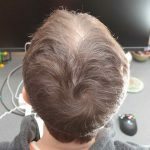 Weakening of the follicles maybe? Since my chemo treatments were only 5 years ago, that’s what I’m thinking has caused my thinned hair. That and hormones. But I’m giving the iRestore a try. I told the PR person who offered these details and they didn’t decline the offer, so we’ll see if it helps. I’m 25% into the initial 16-week treatment. I’ll be posting my first update to the review next week. Wow, I would have never known Julie! I just thought you kept your hair short and it was thin. You look great. 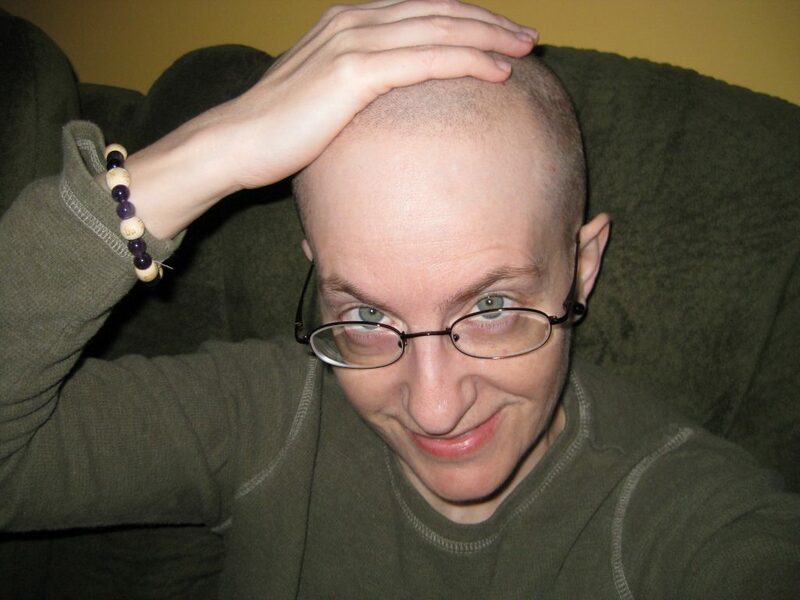 I was on heavy dose long term antibiotics a few years and people with my disease lose their hair. 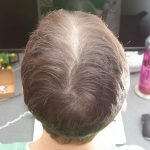 I have very thick and fast growing hair until treatment. 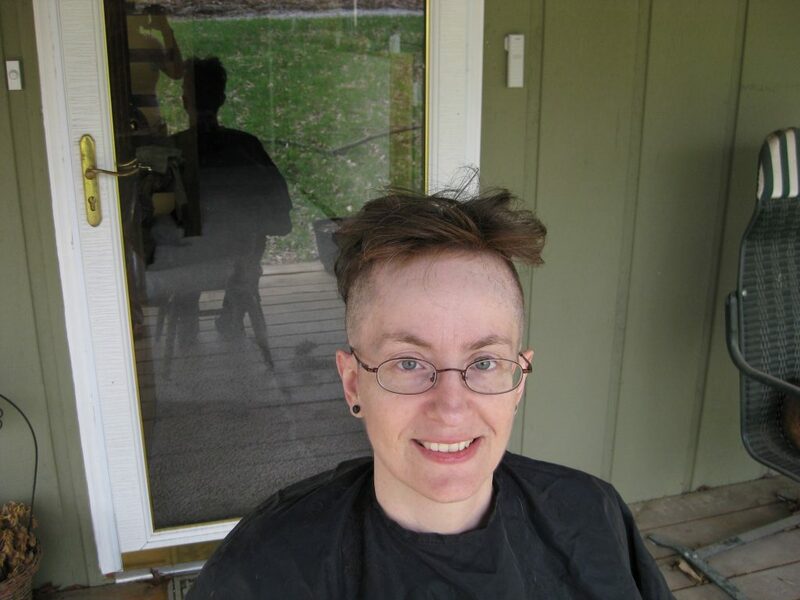 I did not lose my hair, it simply broke off and I wore a layered cut to conceal it. Then when I came off treatment was when it started falling out by the tons. 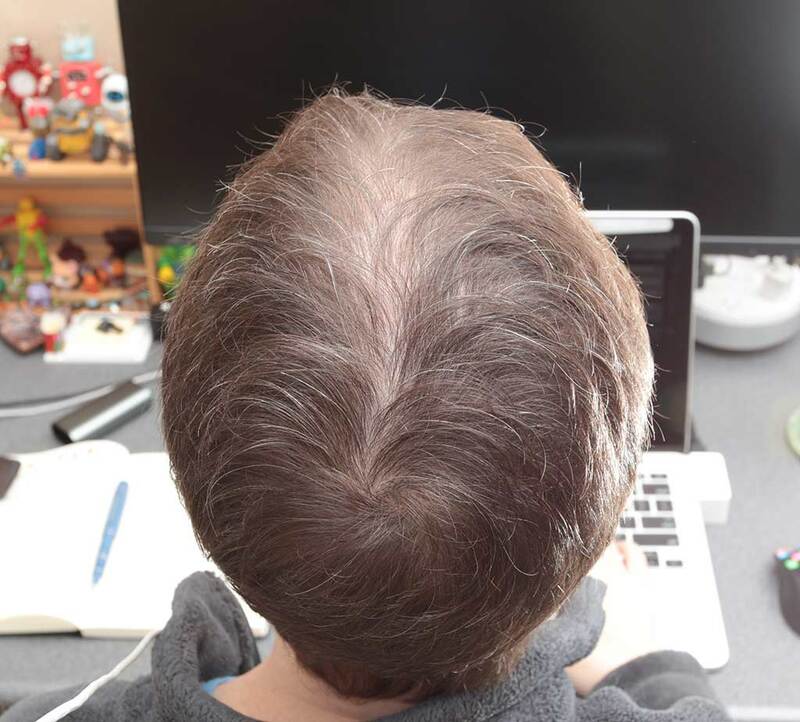 A few months after, it started growing back and now I have all these short stick up pieces all over my head and they are taking forever to get long enough to lay down (hair spray helps). I would not worry about rude people in Walmart, or any store as this world is full of them. They are the sad ones. I like your hair! Thanks so much for doing a review did you continue using the product? Very curious if you got any results. You can follow my updates to this review at the bottom of the review. I’ve continued to update it with my results during the 16 week test period which will be over in about a month. So far I’ve not really noticed any changes. Will you be returning it with the 6-month money back guarantee if you see no results? Just curious how much of a “shot” you’re willing to give them. It’s on sale for $500 right now, and assuming there are no ill-effects for LLLT, I’d like to be able to get my money back if this doesn’t end up working for me. I did not purchase it. It was sent to me by iRestore for review purposes. I will probably gift it to a hair folic challenged friend after the 16 weeks are up. Given the sale they have right now, I am considering it. I didn’t do enough consultation with enough people regarding any possible “safety” hazards along the way though, including how guaranteed I get my money back if there are no results. I haven’t had any issues safety wise. I’ve been using the device for about 12 weeks now. It doesn’t get hot. Hi Julie – I just wanted to say thank you for your review. 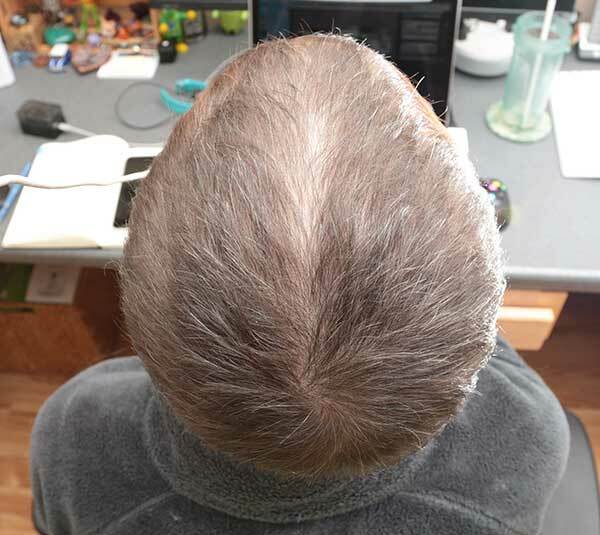 I have been diagnosed with chronic telogen effluvium almost 2 years ago and experience considerable daily shedding with pretty much no regrowth noticeable. I’m still contemplating purchasing this crazy device at this point but your ongoing review has helped add some perspective. Looking forward to the next update. This is a very helpful review, thank you. The photos show very clearly the result. I saw the device on Facebook and was ready to buy, you’ve saved me from thinking this will definitely work. I wonder if females with telegen effluvium (like me) have tried the device and if it has worked. 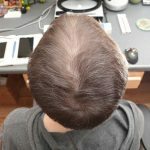 My dermatologist has a laser they use for psoriasis that she offered me for my hair loss. $75 a go, so I thought buying a device might be a better way to go. This device only has 21 lasers (and LEDs are ineffective by the way), so of course it wasn’t going to work. 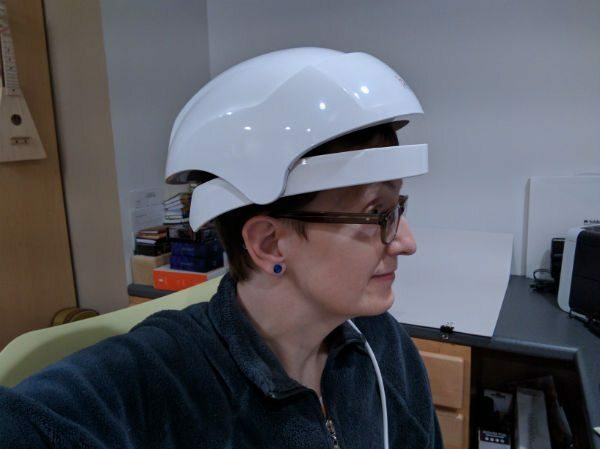 You’d want a device with at least 300 laser diodes, such as the “Laser Messiah” helmet, which is pretty similar to what an actual laser clinic would use. There are also other things you can do such as scalp massage/microneedling, certain topicals, essential oils etc. This is fraud company, how refund your money very late after one month once you submitted your device and detect restocking fees. they dont have billing department number where you can resolve your issue. I think they use customer money in other place and ask to customer to wait for his money. I resolve my issue after 2 months. They also charge shipping cost.